Former Michigan Supreme Court Justice Diana Hathaway and her lawyer Steve Fishman leaving the federal courthouse in Ann Arbor after sentencing. An interview with Rick Pluta about Diane Hathaway. Former Michigan Supreme Court Justice Diane Hathaway was sentenced for bank fraud in federal court today in Ann Arbor. 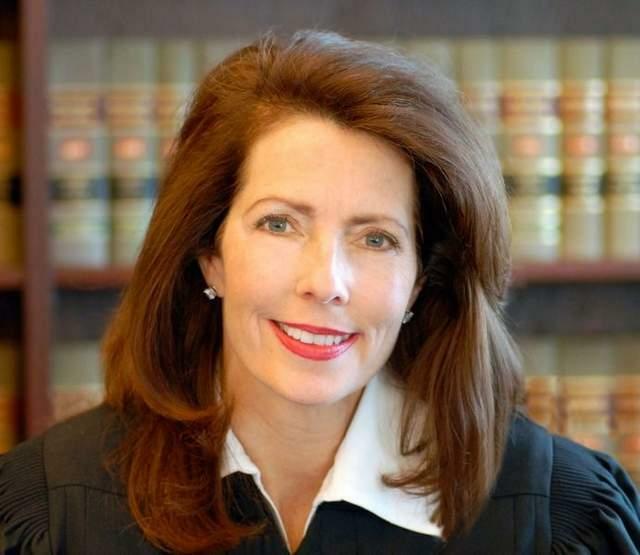 Hathaway was forced to resign in January, halfway through her eight-year term on the state Supreme Court. She resigned before pleading guilty to a scheme to cheat a bank by hiding assets including a vacation home in Florida. That helped her qualify as a distressed homeowner, so she could then sell a lakefront home in Grosse Pointe Park as a short-sale. Rick Pluta, Lansing Bureau Chief for the Michigan Public Radio Network, has been covering this story for us, and he joined us today in the studio. Former Michigan Supreme Court Justice Diane Hathaway finds out tomorrow whether she’s headed to prison for bank fraud. Hathaway pleaded guilty in federal court to concealing a vacation home in Florida, and other assets, to engineer the short sale of a lakefront property in Grosse Pointe Park. She also resigned the state Supreme Court seat she won in the 2008 election. Hathaway stood quietly at a podium in U.S District Court in Ann Arbor this morning, acknowledging she intentionally defrauded a federally-insured financial institution when she short-sold her Grosse Pointe Park home. According to an agreement negotiated with the U.S. District Attorney’s Office, her punishment is limited to up to 18 months behind bars or could be as little as 4-10 months if a pre-sentence report determines there was no actual financial loss. “Yes your honor, I agree,” Hathaway said to Eastern District Court Judge John Corbett O’Meara. Fishman has previously said Hathaway and her husband, attorney Michael Kingsley, saved the bank $150,000 by negotiating a short sale of their home rather then letting it be sold at a foreclosure auction. But prosecutors have tripped up Hathaway on a fraud charge because she and Kingsley transferred a posh second home in Windermere, Fla., valued at $664,000, to one of Kingsley's daughters while applying for the short sale — and then got the house back after selling the Grosse Pointe Park home. During the short sale process, in 2010 and 2011, Hathaway also acquired two other homes in Grosse Pointe Park on Windmill Pointe and Balfour Street and transferred them to her stepchildren. Hathaway's stepdaughter, Sarah Kingsley, transferred the Balfour Street back to Hathaway after the short sale of the home on Lakeview Court, public records show. U.S. Attorney Barbara McQuade plans to hold a press conference this afternoon to talk about the Hathaway case. Hathaway is accused of concealing assets while trying to persuade a bank that she needed a short sale. That was to get rid of a Grosse Pointe Park home that carried a big mortgage. Her hearing is set for today in Ann Arbor federal court. Hathaway was charged Jan. 18, three days before she left the Supreme Court because of the scandal. She and her husband transferred a debt-free Florida home to a relative before the 2011 sale of their Detroit-area home. After the short sale went through, the Florida property went back in their names. Hathaway was elected to the Supreme Court in 2008.